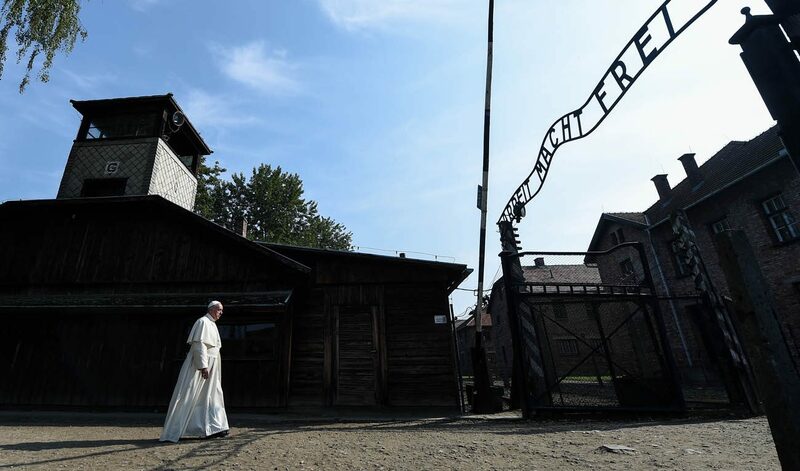 JERUSALEM (CNS) — Following a joint visit to the Auschwitz-Birkenau concentration camp in Poland, Israeli religious leaders urged world leaders to act with “unwavering resoluteness” against the anti-Semitism and hatred toward others becoming more prevalent in today’s society. “We repudiate racism, fanaticism and extremism, particularly when these are committed, allegedly, in the name of religion and, in so doing, desecrate religion,” they said in a statement released Nov. 8. The delegation included Archbishop Pierbattista Pizzaballa, apostolic administrator of the Latin Patriarchate of Jerusalem; Greek Orthodox Patriarch Theophilos III; Melkite Catholic Archbishop Georges Bacouni; and Anglican, Druze, Jewish and Muslim religious leaders. “We declare our commitment to cooperate and to do everything in our power to carry out this important call in the Holy Land, as well to strengthen the harmony and understanding that exist in Israel among the various religious communities,” they said. They met with Archbishop Stanislaw Gadecki, president of the Polish bishops’ conference, and laid a wreath of flowers at the Wall of Death where executions took place in the camp. It is estimated that 90 percent of the at least 1.1 million people who were killed at Auschwitz were Jews. Other victims of the Nazi concentration camp included Roma, Poles and Soviet prisoners of war. “We, the leaders of the major religions in Israel and members of the Council of Religious Community Leaders, believe in the Creator, who rules the world with benevolence and mercy, and requires of us to live with all persons in peace and mutual respect. Our religious heritages teach that peace and the pursuit of justice are the will of God, and we as religious leaders bear particular responsibility to be attentive to the cries of the poor and the weak among us and to act to advance a more just society,” they said.